First, this shows off a simple shapes game I put together. Pickup the shapes and shoot them in their corresponding homes. Second, this shows off a maze game I put together. Follow the maze to the end, and if you fall through a hole, you reappear back at the beginning. Third, this shows of a tile game I recreated. Click tiles to clear out sections that have multiple touching tiles. More tiles cleared at once means more points. 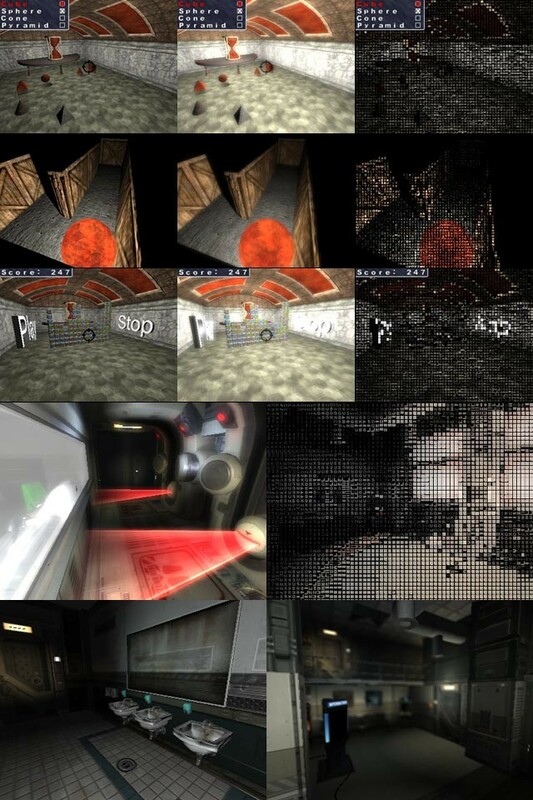 The last four pictures are to show off some higher quality pictures, through Doom3 data. I have a Doom3 level format plug-in for the engine, so that I can load Doom3 levels, including plug-ins for LWO, ASE, and MD5 models, so that things can be loaded correctly in the level. Overall, performance is decent, though I only have a Raedon9600, so it really lags at higher resolutions. Also, the fours pics are glare, normal rendering, ASCII, and depth of field, though you can't see the depth of field as well in this smaller screen shot. As for the engine, it uses deferred lighting, with support for diffuse and specular bump mapping. I also support an array of post processing filters, which is great since I also already have position information for each pixel on the screen (thanks to deferred lighting), so that I can support things like Depth of Field. Currently, I have a glare, depth of field, gamma correction, sepia/grayscale toner, and ASCII conversion filters. I also support dynamic shadow mapping, though I am working on a quick have for static light mapping in real time. Basically, I want to render the shadow maps for static lights when I load the level, without rendering dynamic objects. Then I'll have static shadow maps that I can use through out the level, they just won't include dynamic objects in the shadows, but I won't have to render the shadow information in real time anymore, which will speed things up considerably. Most of the engine is my own doing, though I do use zlib for ZIP archive support, DevIL for image decoding, Audiere for audio file decoding, and Newton for physics.